Professional photo watermarking software – Easy, fast and fully featured batch photo watermarking. Do you want credits for your images and/or you brand then you should consider adding a watermark to all images you are posting online. With your name or website added as a watermark to a photo you are more likely to get the credits. The harder you make the watermark to remove the more sure you can be of getting the credits. Another use of a watermark could be to stamp the file date/time the photo was taken to the image to make sure the image has not been tampered with. Easier to use than Adobe Photoshop – Quick to learn. Quick and efficient – batch watermark thousands of photos without user action. Copy protection – Create solid watermarks that are hard to remove. Reliable and Stable – Gets the job done without tweaking. 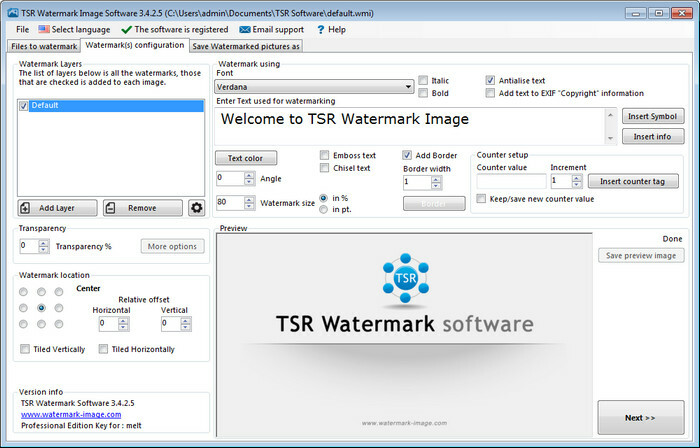 Designed for Watermarking – Professional software for adding watermarks.